Featured: ASOS Bouncing Bunnies headscarf, ASOS Shirt with Rabbit Print, eShakti Bunny Hop Dress, ASOS Bouncing Bunnies Bow Collar. 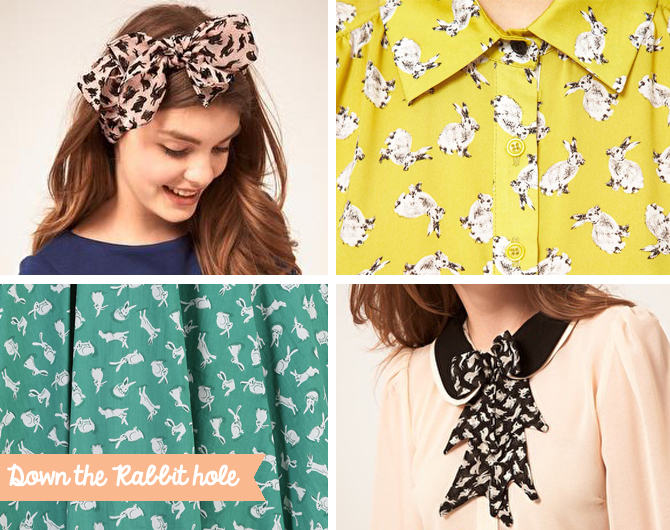 I think I adore clothes with bunny prints on them as much as I adore actual bunnies! We're used to seeing clothes and accessories with animals such as birds or cats, but ones with rabbit prints are a little less available. These lovely rabbit print pieces that I found online are so freakin' adorable and a fun way to make a basic outfit stand out. These are some super cute finds you've shared! Really love the first two, although I must admit my weakness is bird things. These patterns are so adorable! cutest thing I've seen today.